Veena is a string instrument made of wood. The museum has an enormous collection of different varieties of veena. 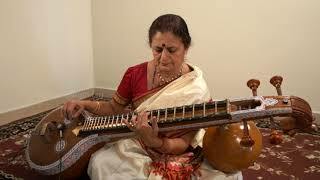 Out of which this veena stands apart with its symbol of the Travancore dynasty. ‘Rajamudra’ is the highlight of this instrument. It has a hollow body and two large resonating gourds under each end. It has four main strings which are melody type, and three auxiliary drone strings.